It’s been a cold and snowy month and I’ve been craving food that is warming but not too rich. 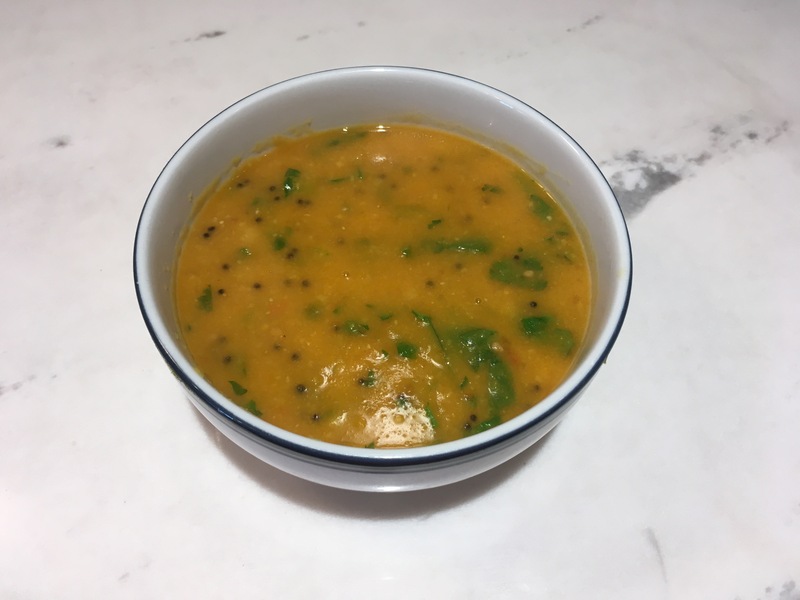 Soups and curries are particularly comforting at this time of year and one of my favorites is this recipe for yellow split pea Dal. I learned to make it from my friend and Indian cooking teacher Farida. Her Dal is the best I’ve tasted, enriched with black mustard seeds, curry leaves and cilantro. I like a very thin Dal but if you prefer it thick just cook it a little longer. It tastes best if made the day before you plan to serve it as the flavor improves with age. The Dal also freezes beautifully. In a 5-quart stockpot combine rinsed split peas, water and salt. Stir then cover and bring to a boil on medium high heat. Once the water has boiled, there will be foam at the top, remove the foam then lower heat to medium low, keep partially cover and cook about 1 hour and 20 minutes until peas are tender and falling apart and the cooking water is cloudy. It should look like weak, watery soup. Purée with an immersion or hand blender. In a bowl combine crushed tomatoes with garlic, coriander, cumin, and turmeric. Pour tomato mixture into the puréed peas and purée again. Taste and adjust salt. Bring to a boil and add chopped peppers. Cook 5-10 minutes. It should still be thin. If it seems too thick add 1/2 cup very hot water or more to desired consistency. In a small frying pan with a lid, heat vegetable oil on medium heat. When oil is hot but not smoking, add mustard seeds. They will start to sizzle and pop then add curry leaves. Immediately place a cover on the pan and turn pan over and shake. Quickly add oil and spices to the split pea mixture. Stir in the cilantro. Let cook for just a minute. The Dal should be the consistency of a very light gravy. Serve over basmati rice. Serves 6. This entry was posted in Dairy-free, Grains, Soups, Vegetarian. Bookmark the permalink.